Sachin Ramesh Tendulkar (born 24 Aprile 1973) is an umwhile Indian cricketer an caiptain, widely regairdit as ane o the greatest batsmen o aw time. He teuk up cricket at the age o eleiven, made his Test debut on 15 November 1989 against Pakistan in Karachi at the age o sixteen, an went on tae represent Mumbai domestically an Indie internaitionally for close to twenty-fower years. He is the anly player tae hae scored ane hundwe internaitional centuries, the first batsman tae score a dooble century in a One Day International, the haulder o the record for the nummer o runs in baith ODI an Test cricket, an the anly player tae complete mair nor 30,000 runs in internaitional cricket. ↑ 1.0 1.1 Bal, Sambit. "Sachin Tendulkar—Cricinfo Profile". ESPNcricinfo. Retrieved 14 December 2007. "Sachin Tendulkar is greatest cricketer in history – Brian Lara". BBC. Retrieved 19 November 2013. "Is Sachin Tendulkar the greatest batsman of all time?". The Daily Telegraph. Retrieved 19 November 2013. "Revealed! 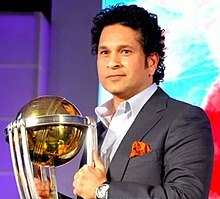 What makes Sachin Tendulkar the greatest batsman..." rediff.com. Retrieved 5 August 2014. "Greater than Bradman". Wisden Almanack. Retrieved 19 November 2013. This page wis last eeditit on 21 Januar 2017, at 22:43.